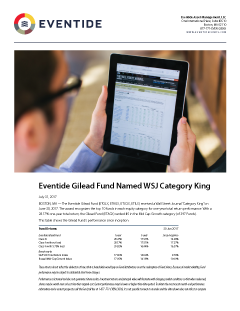 BOSTON, MA (Globe Newswire) — BOSTON, MA — The Eventide Gilead Fund (ETGLX, ETAGX, ETCGX, ETILX) received a Wall Street Journal “Category King” on June 30, 2017. The award recognizes the top 10 funds in each equity category for one-year total return performance. With a 28.17% one-year total return, the Gilead Fund (ETAGX) ranked #5 in the Mid Cap Growth category (of 397 Funds). These returns do not reflect the deduction of taxes that a shareholder would pay on Fund distributions or on the redemption of Fund shares. Because of market volatility, Fund performance may be subject to substantial short-term changes. Performance is historical and does not guarantee future results. Investment returns and principal value will fluctuate with changing market conditions so that when redeemed, shares may be worth more or less than their original cost. Current performance may be lower or higher than data quoted. To obtain the most recent month-end performance information and a current prospectus call the Fund, toll free at 1-877-771-EVEN (3836). It is not possible to invest in an index and the data shown does not reflect or compare features of an actual investment, such as objectives, cost and expenses, liquidity, safety, guarantees or insurance, fluctuations of principal or return, or tax features. Gilead Fund expenses: Class A, Total Expenses 1.48%; Class C, Total Expenses 2.23%; Class I, Total Expenses 1.23%; Class N, Total Expenses 1.43%. Performance figures for periods greater than 1 year are annualized. The Fund’s share classes have different inception dates. Class N has an inception date of 8 July 2008. Class A and Class C have an inception date of 28 October 2009. Class I has an inception date of 2 February 2010. The indices assume an inception date of 8 July 2008. The S&P 500 is an index created by Standard & Poor’s of American stocks with the largest market capitalization. The Russell Midcap Growth Index measures the performance of the U.S. equity mid-cap growth segment. It includes mid-cap companies with higher price-to-book ratios and forecasted growth. Neither are investment products. The indices’ volatility may be materially different than that of the Fund, and investors should not expect the Fund to achieve the same results as the indices listed. Eventide manages more than $1.8 billion and also offers the Eventide Healthcare & Life Sciences Fund and Eventide Multi-Asset Income Fund. Wall Street Journal rankings are not intended to constitute investment advice. Rather, the rankings are for informational purposes only. There is no guarantee that Eventide will meet its objectives or that Business 360 principles will produce the desired results. Mutual Funds involve risk including the possible loss of principal. Past performance does not guarantee future results. The Fund can invest in smaller-sized companies which may experience higher failure rates than larger companies and normally have lower trading volume than larger companies. The Fund’s ethical values screening criteria could cause it to underperform similar funds that do not apply such screening. The Fund can have risk associated with the biotechnology and pharmaceutical industry in which these companies may be heavily dependent on clinical trials with uncertain outcomes and decisions made by the U.S. Food and Drug Administration. Companies in technology industries have different risks including, but not limited to, products becoming obsolete, and entrance of competing products. Companies in the Industrial Sector carry various risks including, but not limited to, risk related to debt loads and intense competition. The Fund can have risk related to option investing. There are special risks associated with investments in foreign companies including exposure to currency fluctuations, less efficient trading markets, political instability and differing auditing and legal standards. The Fund can invest in private companies. Private investments include various risks including but not limited to lack of liquidity, capital commitment risk, and valuation risk. Private companies may not be financially profitable and have uncertain futures, subjecting them to additional risks. Because of market volatility, Fund performance may be subject to substantial short-term changes. Investors should consider the Fund’s objectives, risks, charges and expenses carefully before investing or sending money. This and other important information about the Eventide Gilead Fund are found in the Fund’s prospectus, available at www.eventidefunds.com or by calling 877-771-EVEN (3836). Please read the prospectus carefully before investing. The Fund is distributed by Northern Lights Distributors, Member FINRA/SIPC, which is not affiliated with Eventide Asset Management, LLC.